The United Kingdom-based International Brewing and Cider Awards 2019 were held this month, with four Australian breweries winning international honours. This year’s awards attracted more than 1,000 entries from 50 countries. 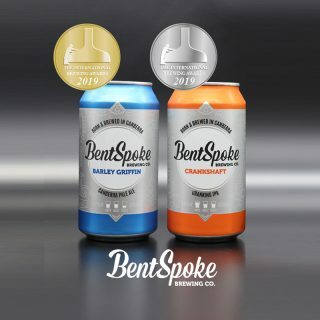 Canberra-based brewery BentSpoke has won two medals, gold for its Barley Griffin Pale Ale and silver for its Crankshaft IPA. This is the second time these two beers have won these two awards. BentSpoke head brewer and co-owner Richard Watkins said the brewery is proud that Canberra has been so well represented on the world stage. “In the ever-growing world of craft beer, holding your place in the podium finish is no easy thing,” Watkins said. Both medal-winning beers featured in the top 11 of this year’s GABS Hottest 100 Craft Beers, with Crankshaft having a podium finish. Watkins told Brews News that competitions like this are a good way to advertise on a global scale. “At BentSpoke, we’re obsessed with giving people the best brew, every time – so that’s what constantly pushes me to enter. “And of course, there’s a bit of Canberra pride involved – it’s always nice to see our little city do well at international competitions, whatever the category. One of Queensland’s largest beer brands, Lion-owned XXXX, has also received international recognition, taking out a silver media for its XXXX Bitter and bronze for its XXXX Gold. Lion Australia’s brewery director Irene Bell said it’s not surprising news to Queenslanders, but that perhaps the Brits are finally waking up to the best beer from the sunshine state. “XXXX Gold and XXXX Bitter, along with all the beers we make, are a credit to the entire team who work at Castlemaine Perkins,” Bell said. Tasmanian beer brand James Boag’s, another Lion subsidiary, also made it onto the dais winning two bronze medals for its Tasmania exclusive Wizard Smith Ale. Boag’s head brewer Nathan Calman said he was chuffed for his team and for their great-tasting Ale. “I love seeing our visitors when they try Wizard Smith for the first time,” Calman said. “It was well and truly ahead of its time before the current boom in IPA and XPA styles we are seeing today. Hahn is the third Australian Lion-owned brand to win recognition at this year’s awards. The brewery’s new release Hahn Ultra Crisp took out a silver medal in the gluten-free class. The International Brewing Awards have been held in the UK since 1888 and are colloquially known as the Oscars of beer. With a 130-year history, the Awards are the oldest brewing competition in the world. Over 200 breweries and cider mills submit entries and medals for judging in nine beer categories. For a full list of winners, please visit here. XXXX gold won an award? Then those awards mean nothing.